With more than 9 years of experience and many happy patients under his brief but illustrious career, Dr. Dharamvir Singh is one of the most reliable dermatologists working in Karol Bagh, Delhi. He is presently affiliated with Dermatology Hair & Aesthetic in Karol Bagh, Delhi. Apart from specializing in dermatology / cosmetology, Dr. Singh also provides effective remedies to hair cosmetology related disorders and venereology. 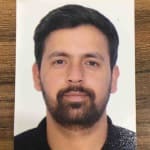 Dr. Singh received his MBBS from the prestigious Guru Govind Singh Indraprastha University in 2007.in 2004 and his MD, specializing in Dermatology, Venereology & Leprosy from Guru Govind Singh Indraprastha University in 2011. Dr. Singh is also a professional member of reputed medical associations including Indian Medical Association and Medical Council of India. In his own clinic, he offers a wide range of services that includes treatments for ringworm, nail diseases treatment, intra-dermotherapy, Chemical Peels treatment, Antiaging Treatment, bleaching treatment, Acne Treatment and Botox treatment to provide effective remedies to the patient. So, in order to get rid of your skin problems and get wholesome remedies, it is recommended to avail the effective and efficient services of Dr. Dharamvir Singh.